Did you know, wetlands in Ohio – and possibly in this region? — are disappearing at an alarming rate? Since the late 18th century, most of Ohio’s wetlands have been destroyed or damaged through draining, filling, or other modifications. Only 10 percent of the original 5 million acres of Ohio’s wetlands remain, according to the US Fish and Wildlife Service. And local planning and zoning regulations – despite good intentions – aren’t helping. Wetlands are areas where water covers the soil or is present either at or near the surface of the soil all year or for varying periods of time during the year. Wetlands provide many natural services. They provide a vital service to our rivers, streams, and groundwater by removing contaminants from water, storing floodwaters, creating habitat for plants and animals, and adding natural beauty. MCD preserves natural features in some areas along our rivers – including floodplains and wetlands – to store floodwaters, protect habitat, and filter water runoff. Those natural features – and their benefits – could be included in new developments today through the principle of better site design. Despite good intentions, local planning and zoning regulations can lead to less than ideal outcomes when it comes to saving wetlands. Regulations, intended to prevent pollution or flooding, can fail to consider the services that natural ecosystems provide. A recent case about two wetlands in a nearby township illustrates this point. In 2017, a developer went through the normal planning and zoning process for a residential planned unit development (PUD) and received all the necessary permits from the township and county. 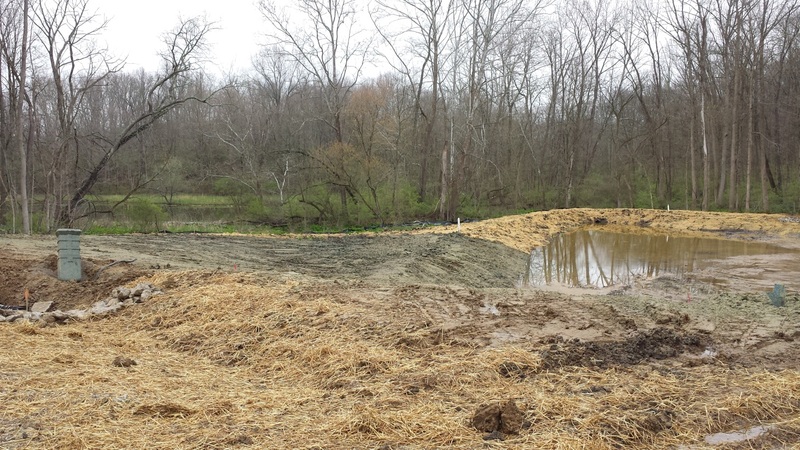 While working through the permit process, the developer identified the first wetland – using federal and state wetland inventories – near the construction site. The developer’s plan left the first wetland intact. During construction, the developer stumbled upon a second wetland, called a kettle bog, not identified on the wetland inventories. (Kettle bogs form in a depression created when a chunk of glacial ice covered by glacial debris melts away.) The bog was found when a dozer got stuck in the bog while the developer was trying to clear vegetation from the construction site. Much of the construction site naturally drained toward the bog and then toward the first wetland. Once the developer found the bog, he was required by the permit process to change site drainage plans, forcing him to relocate a cul-de-sac. Why did the bog have to be destroyed? Couldn’t the bog serve the same purpose as a detention basin? It’s possible, says the local planning administrator. And with the land sloping toward the first wetland, any additional runoff could have been handled as well. Wetlands are great at temporarily storing stormwater runoff and removing contaminants. Why not let the natural wetlands do what they do best? Wetlands are great at temporarily storing stormwater runoff and removing contaminants. All projects that involve dredging or filling activities in wetlands require a permit from the U.S. Army Corps of Engineers (Section 404 of the Clean Water Act). Unfortunately, many Ohio wetlands are not yet identified or mapped, as in this case. It’s probable that situations like this come up frequently in our region, but few planning and zoning authorities have adequate measures in place to ensure wetlands are protected. Require developers to collect soil samples for analysis, if the development is close to a known wetland or if there is reasonable evidence that wetlands may be present on a site. Require the developer to have a professional wetland delineation performed at the development site, if soil samples show the presence of wetland soils. Revise existing stormwater regulations to allow wetlands to be considered as a stormwater solution, when possible. Revisions like these could have saved the developer a significant amount of time and money. He could have avoided installing a detention pond, stabilizing a road built upon unstable wetland soils, and reworking the street alignments. And there would be one more vital wetland left in Ohio.